Looking for an economical way to combine business advertising with cheap takeaways? Custom printed promotional materials are a great option for any business because they are useful everyday items imprinted with company logos, branding, contact information, and other messaging. This type of economical business accessory is designed for bulk quantity purchase to take advantage of low unit pricing, allowing personalized company freebies to offer added value as cheap trade show booth gifts or takeaway gifts. Unlike traditional sales literature, branded promotional materials, like these custom printed tradeshow giveaways carry an element of useability or even fun that means customers and patrons will use them on a daily basis. In addition to building name and brand recognition, that means that each of these economical promotional materials is functioning as a free advertisement every time it is used! Advertising logo pens are the most affordable individual event giveaway and can be ordered in a choice of two-color designs combining red, silver, black and white. Simple imprints allow brand graphics as well as contact information to be literally placed in customers hands. Cheap customized Bic pens make great imprinted trade show gifts because recipients will bring them back to their office or home for daily use. Similarly, imprinted tote bags are ideal for use at events because patrons will use them to carry around other freebies and takeaways. 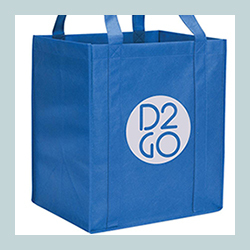 Our durable polypropylene carry bags come with a lower board for support and a bold, personalized 1/color graphic. Small personalized hand sanitizer dispensers are an ideal and cheap giveaway for crowded trade show events. These antibacterial gel pocket packs come with a carabiner and choice of colored flip-top caps. Customized drinkware also offers superior visibility because customers will not only use the trade show handouts during the event itself, but long afterwards. Lightweight plastic personalized tumbler cups and tall water bottles are long-lasting, reusable alternatives to heavy personalized travel mugs. Choose from our selection of economical promo items to match imprinted table skirts and customized tradeshow booth accessories from TableSkirts2go.com today!